With pollinator conservation in mind it’s a good idea to plant flower seeds for bees. But which are the best pollinator plants? 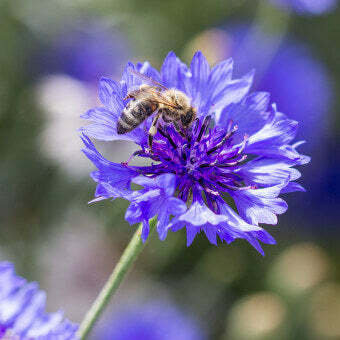 Which bee flowers are the easiest to sow and grow? 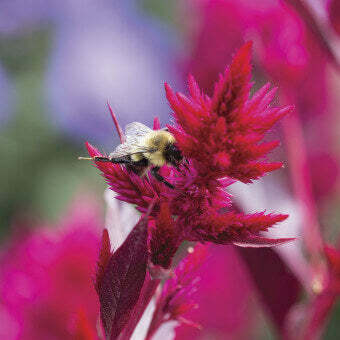 What flowers can be grown in containers or schoolyards to attract pollinators? An easy-to-grow perennial plant that comes back every year in full sun or partial shade. The flowers are edible, but leave some for the masses of wild bees and butterflies it will attract. Height to 120cm (48″). A beautiful and easy annual that is attractive to wild and domestic bees, and particularly useful in companion planting, as it is highly attractive to predatory insects. 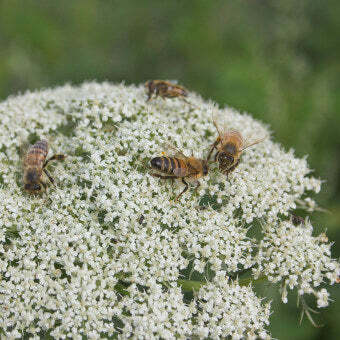 Plant Ammi and let these natural scavengers eliminate caterpillars, aphids, and other garden pests. Height to 50cm (20″). This perennial is listed everywhere for attracting butterflies, including the Monarch butterfly when planted in the Monarch’s range. The flowers are incredibly generous with nectar, so it is also a magnet for wild and domestic bees, hummingbirds, and other pollinators. It is slightly challenging to grow from seed, needing an early start indoors. Asclepias tubers are also available, and a little easier to plant in spring. Height to 70cm (27″). 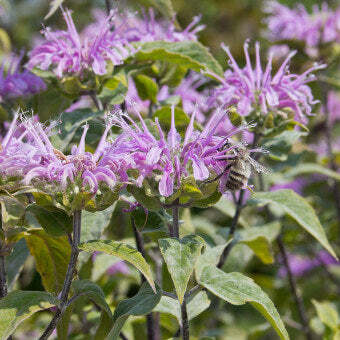 Both Lemon Bergamot and Wild Bergamot bloom in late summer, after many bee-friendly garden flowers have finished. But they are both wildly attractive to all manner of bees, as well as butterflies and hummingbirds. These tender perennials may or may not survive winter in coastal gardens, but they may self-sow from flowers that produce large numbers of seeds. Wild Bergamot is the taller of the plants, growing to 90cm (36″). Both work well in raised beds and flower borders. 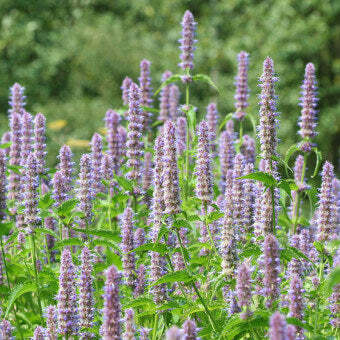 This perennial herb has intense blue, edible flowers that have an appealing and mild cucumber taste. 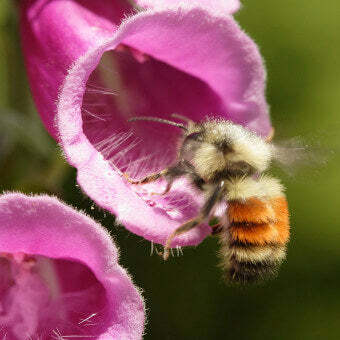 The flowers are attractive to numerous bumblebee species — the bees use their buzzing muscles at a specific resonance for the flower to release a blast of pollen. 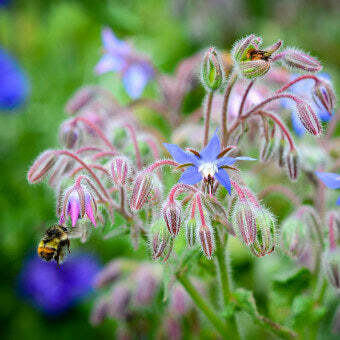 Borage only grows to about 60cm (24″) tall, but it may gradually spread in the right soil and light conditions. Or it can be grown in containers or raised beds. This superb annual plant is very easy to grow and has many uses. 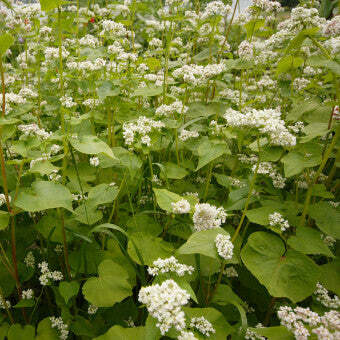 Buckwheat’s nectar-rich flowers are attractive to honeybees. Buckwheat honey is famously dark in colour and richly flavoured. This fast-growing plant makes an excellent cover crop, smothering out weeds and producing lots of organic matter. Cut the stems after flowering and till them under to improve soil texture and fertility. Or harvest the seeds and grind for flower. Buckwheat can grow up to 75cm (30″) in just six weeks! Super easy to grow, good in containers, and it even produces edible flowers. Tear off some of the golden orange and yellow flowers to sprinkle over summer salads. 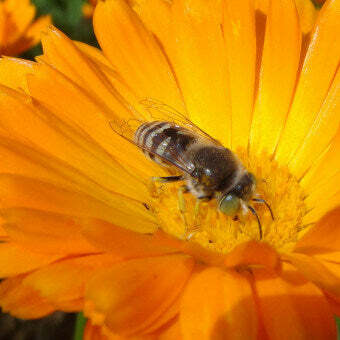 Calendula is also attractive to wild bees, butterflies, and other beneficial insects. Height to 60cm (24″). 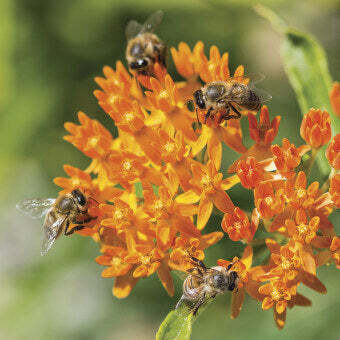 You won’t believe how many honeybees flock to the flowers of this tall perennial. Cardoon was the original artichoke, and produces edible stalks. It will grow 1.2-2m (4-6′) tall, so give it a place near the back of the garden, and enjoy its stunning purple flowers as much as the bees do. Ideal for containers or raised beds, this striking annual produces an inflorescence that is shockingly red. The plants stay compact at only 35cm (14″) or so, but they bring in bumblebees and other wild bees from far and wide. The seeds want an early start indoors in peat pots for best results. So easy to grow, with so many uses, Centaurea produces intensely blue flowers on individual stems that grow to around 90cm (36″) tall. The flowers are edible, so they’re great for summer salads, and they dry particularly well for fall arrangements. But they are also highly attractive to bees and other pollinators. Grow this annual in pots or in clumps around the garden for a great show of summer flowers. Every garden, whatever the size, deserves at least one clump of multi-purpose chives. After producing its delicious and mildly onion flavoured leaves, it sends up a globe-shaped cluster of edible pink flowers that attract all kinds of bees. 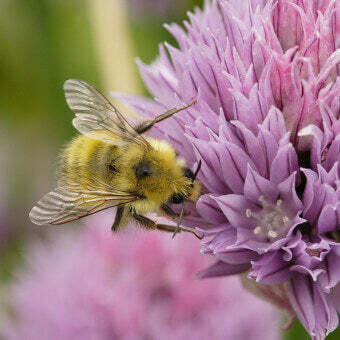 Chives can be grown as companion plants to repel aphids and at the same time attract predatory insects and pollinators. They work well in containers and raised beds so they are extremely versatile. This is another easy to grow annual that is available in a range of heights and flower colours. 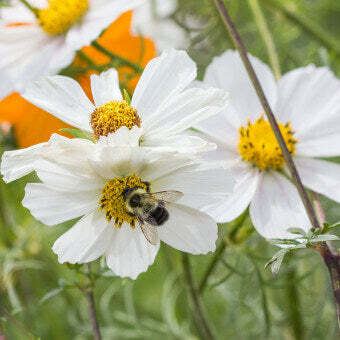 Plant Cosmos, and the bees will come. Most varieties are relatively tall, growing up to 2m (6′), so they are better for the border or raised bed than for containers. But they are easy to maintain and generally fool-proof. Simply remove spent flowers and the plants will continue to bloom all summer. 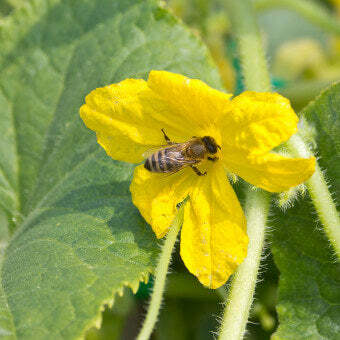 Cucumbers are just one type of garden crop that produces flowers attractive to bees. Cukes have relatively small, bright yellow flowers that grow along vines at each leaf interval. Their larger cousins, the squash, have much bigger flowers, and it’s not uncommon to find five or more honeybees in each flower. Curiously one of the common problems with cucumbers and squash is lack of good pollination. This is because the flowers can be hidden beneath the broad leaves, out of view from foraging bees. The best way to improve squash pollination is to plant some sunflowers in their midst, to bring in pollinators from far and wide. A crown of large leaves grows in the first year for these biennial plants. In the second year, the plant sends up a tall spire, covered in tube-shaped flowers from white to deep purple. The flower inflorescence (flower spike) can be as tall as 2m (6′) or more! Digitalis is very attractive to bumblebees and other wild bees, but the flowers are certainly not edible for humans. All parts of the plant are toxic if eaten. Keeping with the purple them is this familiar garden perennial. The long-lasting blooms make excellent cut flowers, but are also attractive to bees, hoverflies, and other beneficial pollinators and predators. Echinacea tends to put on its best display during and after its third year of growth, but it is a wonderful flower for cottage gardens and allotments alike. Height to about 90cm (36″). 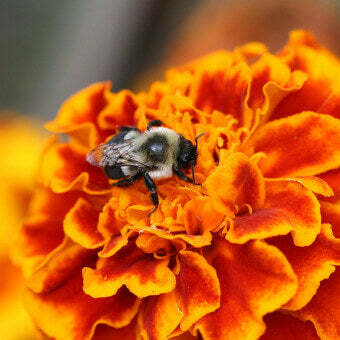 Useful as ornamental flowers and also as companion plants, Marigolds are easy to grow annuals that work well in containers, raised beds, or pretty much any other setting. And they produce pollen in sufficient quantities to attract mid-summer bumblebees and other pollinators. 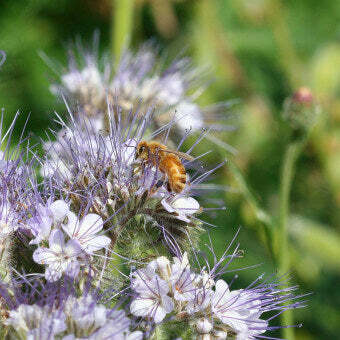 Any gardener who has planted Phacelia will know just how attractive this annual is to bees of all kinds. The nectar rich flower heads unfurl like fern leaves, revealing flower after flower over weeks in the garden. 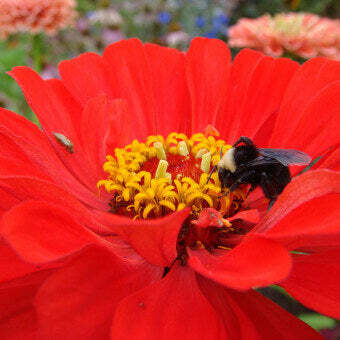 Honeybees, bumblebees, and scores of other wild bees keep the flowers buzzing from early to late summer. Phacelia can be grown in containers, but works best in raised beds or set in the garden in full sun to partial shade. This easy to grow plant may reach 23cm (9″) tall. Watch Mark talk about Phacelia on YouTube. The face of a sunflower is actually landscape of tiny, individual flowers packed tightly together. The myriad, nectar-rich flowers open over weeks, first in the outer perimeter of the bloom, moving towards its center. 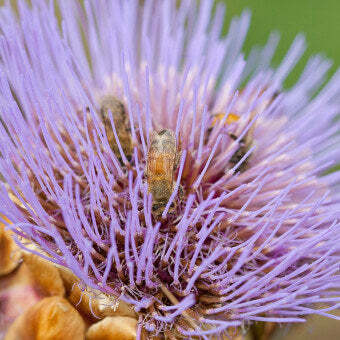 Because of the slow release of lots of pollen and nectar, bees will return to the same plant day after day. 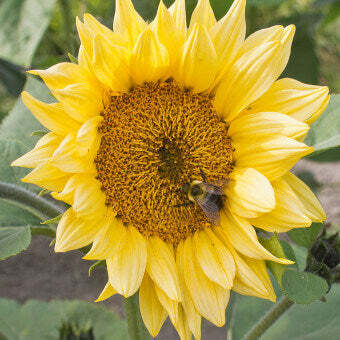 The unusual height of sunflowers makes them act like beacons in the garden, attracting bees from great distances. This makes them useful for increasing pollination in crops like squash, in which the flowers might be covered by foliage. Sunflowers are easy annuals that range in height from tiny (for containers) to massive (for open fields). Many of the larger varieties have the additional appeal of producing loads of edible seeds to be enjoyed by the gardener or left for wild birds. This is another easy to grow annual that thrives in warm soil in full sun. Zinnia flowers are similar to dahlias in some ways, starting as a nearly round ball of petals, and slowly opening to reveal a pollen rich banquet for bees. The huge blooms appear atop erect stems and make excellent cut flowers. And the range of colours is almost limitless — they are all brightly coloured and pleasing to the eye. Nearly all Zinnias grow 75-90cm (30-36″) tall, so they will work in larger containers, in raised beds, and in the garden border. That is only a selection of the thousands of flowers that attract and feed bees. 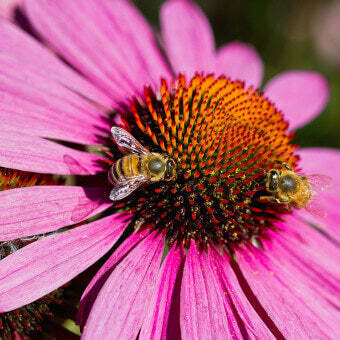 By planting multiple varieties, the garden is made richer as an ecosystem, but the bees are also offered a much longer period in which to feed. As spring flowers fade, summer flowers open for the first time, and so on. Biodiversity is one of the central tenets of organic gardening, and builds healthier plant and insect communities and healthier soil. If you are stuck for space, and only have a tiny area to plant, consider simply planting a packet of low maintenance Bee Garden Wildflower Blend. It will add a splash of bright colour to the corner of your garden, down the length of your driveway, or to your office parking spot. And the bees will be grateful too!